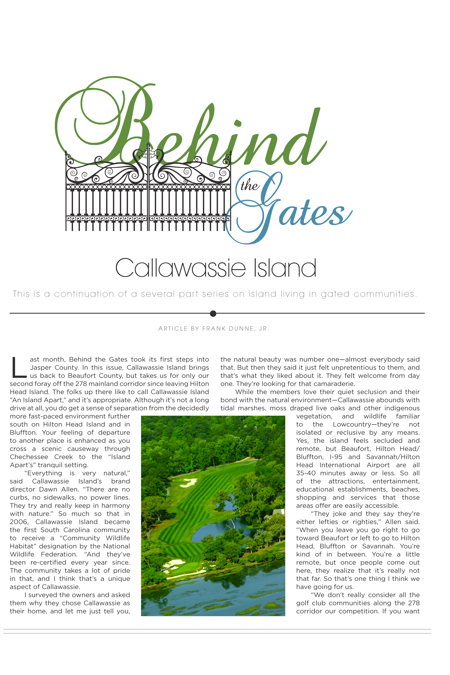 Last month, Behind the Gates took its first steps into Jasper County. In this issue, Callawassie Island brings us back to Beaufort County, but takes us for only our second foray off the 278 mainland corridor since leaving Hilton Head Island. The folks up there like to call Callawassie Island “An Island Apart,” and it’s appropriate. Although it’s not a long drive at all, you do get a sense of separation from the decidedly more fast-paced environment further south on Hilton Head Island and in Bluffton. Your feeling of departure to another place is enhanced as you cross a scenic causeway through Chechessee Creek to the “Island Apart’s” tranquil setting. “Everything is very natural,” said Callawassie Island’s brand director Dawn Allen. “There are no curbs, no sidewalks, no power lines. 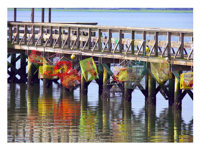 They try and really keep in harmony with nature.” So much so that in 2006, Callawassie Island became the first South Carolina community to receive a “Community Wildlife Habitat” designation by the National Wildlife Federation. “And they’ve been re-certified every year since. The community takes a lot of pride in that, and I think that’s a unique aspect of Callawassie. I surveyed the owners and asked them why they chose Callawassie as their home, and let me just tell you, the natural beauty was number one—almost everybody said that. But then they said it just felt unpretentious to them, and that’s what they liked about it. They felt welcome from day one. They’re looking for that camaraderie. While the members love their quiet seclusion and their bond with the natural environment—Callawassie abounds with tidal marshes, moss draped live oaks and other indigenous vegetation, and wildlife familiar to the Lowcountry—they’re not isolated or reclusive by any means. Yes, the island feels secluded and remote, but Beaufort, Hilton Head/Bluffton, I-95 and Savannah/Hilton Head International Airport are all 35-40 minutes away or less. So all of the attractions, entertainment, educational establishments, beaches, shopping and services that those areas offer are easily accessible. “They joke and they say they’re either lefties or righties,” Allen said. “When you leave you go right to go toward Beaufort or left to go to Hilton Head, Bluffton or Savannah. You’re kind of in between. You’re a little remote, but once people come out here, they realize that it’s really not that far. So that’s one thing I think we have going for us. The members are a very active bunch. Callawassie Island is home to a 27-hole Tom Fazio designed championship golf course, which underwent a $4 million renovation in 2008. Although it is fair to say that golf is Callawassie’s signature amenity, it is far from the only one. Allen estimates that there are probably 30 different clubs to keep folks busy. “We have a Bridge club, there’s a new cigar club, there’s a new vintner’s club, book clubs, Bible studies, you name it. Almost every night there’s something going on somewhere. She went on to list six Har Tru tennis courts with a tennis pro on-site, a tennis pro shop, fitness center, two pools and four community docks. “People crab, fish, boating is pretty popular and we have the third largest paddlers club in the state,” she added. The latter comes as no surprise since Callawassie Island is…well…an island, touched on all sides by the Colleton River, Okatie River or Chechessee Creek. “Waterfront is not in shortage here!” Allen said. Janet Gould and her husband Bob made the move from New Jersey to Callawassie Island in 2005 after visiting communities from Charleston to Hilton Head Island. 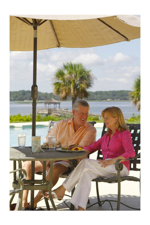 Callawassie Island is not an age restricted retirement community. Allen described the membership as “mature,” with the average age being about 60. “Most of our new members coming in are in their 40s and 50s, so a lot of them still work, at least remotely,” she said. “This is their home office, and with 30 minutes to Savannah’s airport they’re off to where they need to be.” A majority of residents are full-time, about 70 percent, so that gives Callawassie Island that homey, neighborhood personality that you don’t get in resort-style communities with a high percentage of rental properties and second homes. “It’s a pretty tight-knit community. The people are here most of the time,” Allen said. Callawassie Island is 100 percent member owned, so membership is required with property ownership, and a property’s membership is transferred with a change in ownership. Most are Full Island Memberships (also known as Golf Memberships), but about 20 percent of Callawassie Island properties have Social Memberships, which limits a member’s access to golf, but allows use of all other amenities. 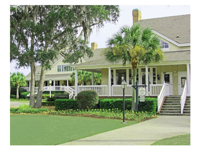 In 2012, Callawassie Island members voted to lower the equity initiation fee to $15,000 to bring it more in line with similar clubs. In all, there are 717 home sites on Callawassie Island, 504 with homes built. Currently there are roughly 60 homes and 60 un-built lots on the market. “Single-story, single family is predominant, but we also have cottages and villas,” Allen said. The architecture is mainly traditional Lowcountry styles, reflecting the community’s laid-back, unpretentious mood. Homes express an understated appeal in contrast to the more grandiose styles that you might find in places such as Colleton River Plantation or Berkeley Hall. Typically, they range in size from about 2,000 to 4,000 square feet and in price from about $200,000 to the mid-$900,000s for waterfront homes. Lot sizes vary, but the majority of them are from a half-acre to an acre. There are a small number of two-story duplexes (villas) and cottages on Callawassie Island. These may be purchased as investment properties and made available for short- or long-term rental. All rentals are subject to POA approval. With frontage on three different bodies of water, Callawassie Island naturally provides plenty of opportunities to have a deep-water access or marsh-front home site. It’s a great place for boat owners. There is no marina, but boat-owning members can rent slips, long- or short-term at Callawassie Island’s community dock. However, most owners who have deep-water access have docks right at their homes. Callawassie Island Club is located at 176 Callawassie Island Drive, Okatie, SC 29909. For general information, call (843) 987-2231; for real estate information, call (843) 987-2125. Visit online at callawassieisland.com.